Kabbage provides credit lines to businesses for covering any expense. Approval gives instant access to funds, and you can draw on the approved amount when you need cash for your business. The terms and fee are easy to understand, and there are no hidden fees. Loans are structured in as credit lines so you can withdraw money as-needed, and the Kabbage card affords you instant access when you need it. Lends to borrowers with fair to excellent credit. Kabbage provides nearly immediate credit lines to businesses for use in covering any type of expense. Once approved, you’ll be notified of how much credit and which of their 2 loan terms you qualify for. Approval gives you instant access to funds, and you can draw on the approved amount any time you need extra cash for your business. Kabbage is designed specifically for small businesses. 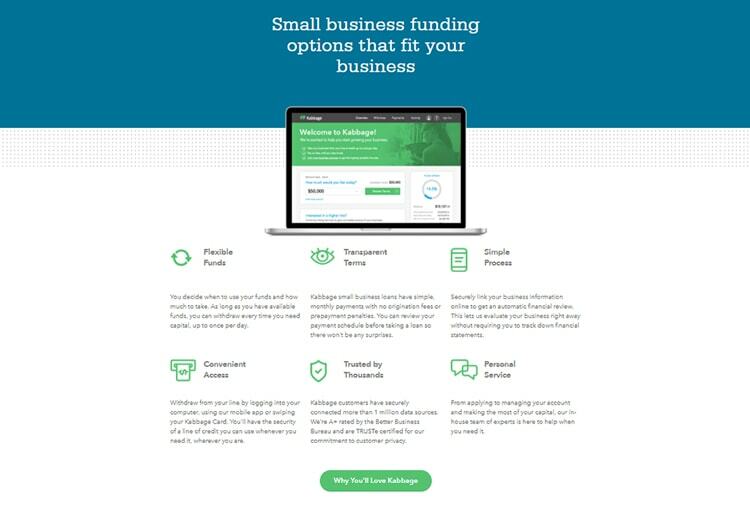 Founded in 2009 by 3 financial entrepreneurs, the alternative lender seeks to provide a faster, easier way for companies to obtain necessary funds. An automated application system utilizes the Kabbage technology framework to “quickly [connect] small businesses with capital.” It offers a platform for businesses to integrate into their own systems to reach customers worldwide. Forbes magazine recognized Kabbage as one of the most promising companies in America in 2014 and 2015, and the platform was featured in the 2015 Inc. 500 list of the fastest-growing private companies in the nation. 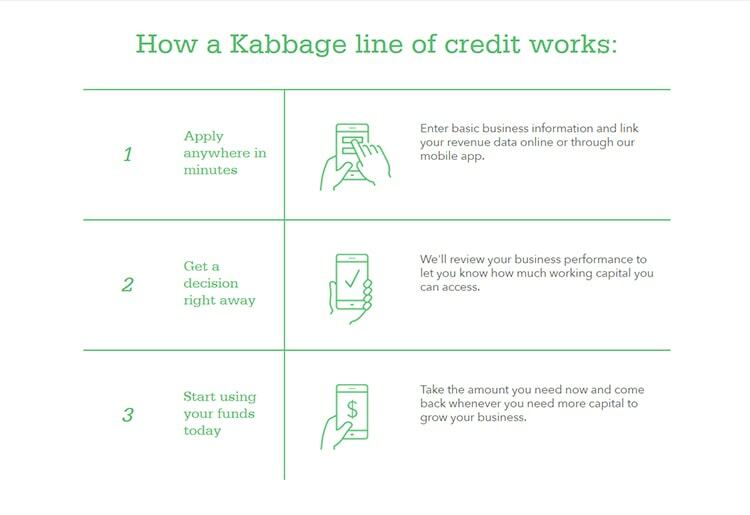 Featuring a simple, straightforward application process and providing access to as much as $250,000 in funds through lines of credit, Kabbage offers an option for businesses looking for a way to avoid the long and complex procedure required when applying for a traditional loan. A line of credit from Kabbage supports you through slow seasons, provides funding for small purchases, and helps cover essentials such as payroll when cash flow is interrupted for any reason. The Kabbage Card allows businesses to draw directly from their existing Kabbage line of credit. In addition to the features listed above, businesses qualifying for a Kabbage loan also get access to perks, including service discounts and free financial help. You may choose to sign up for UPS My Choice, a free 60-day trial of Constant Contact, or free trials of Ecommerce software. Free consultations for taxes and credit and free Vonage business phone services are also available. The card allows businesses to borrow exactly the funds they need, right when they need it. You must have been in business for at least 1 year. Annual revenue must be at least $50,000, or your company must show at least $4,200 of monthly revenue for the last 3 months. You’ll also be asked to create login credentials and connect your bank account. Kabbage provides the opportunity to connect additional business accounts, such as QuickBooks, eBay, Amazon, PayPal, and Stripe. Linking multiple services increases the amount of revenue shown and gives Kabbage a better picture of your current financial status. Checking account information is required to verify your business, and a hard credit check is performed to obtain your credit score. The entire application process should take 10 minutes or less. After receiving your application, an automated system reviews the information and calculates the amount of money and term length to which you’re entitled. If approved, funds can quickly be deposited to the account of your choice. PayPal deposits may be almost instantaneous. Bank deposits can take up to 3 days depending on the bank you use. If your current financial situation doesn’t allow your business to qualify for a Kabbage loan, the company keeps your information on file and reviews it from time to time. Instead of having to reapply in the future, you’ll receive notice from Kabbage when funding does become available. The same process is used to offer an increase in your credit line as your business grows. To qualify for a Kabbage loan and maintain an active profile, all information submitted must be accurate to the best of your knowledge. Kabbage requires users to maintain the accuracy of such information and reserves the right to close accounts not meeting these criteria. Terms from Kabbage business loans are simple and easy to understand, so you don’t have to worry about complicated fee structures or changes in interest rates. The 6-month and 12-month terms require you to pay a percentage on your current withdrawal amount for the first 2 or 6 months, respectively. Kabbage interest rates then drop to 1 percent for the remaining months. Each month, you pay off one-sixth or one-twelfth of the loan plus the monthly fee. If you take out multiple loans, payments are consolidated into a single fee to prevent confusion or missed deadlines. Payments are automatically withdrawn from your connected bank account, but you also have the option to make manual payments whenever you wish. Kabbage doesn’t charge fees for early repayment, so you can choose to pay more than the minimum at any time. Paying off the loan before the terms are up can actually mean owing less overall because you spend fewer months paying associated fees. Although you can withdraw money from your credit line up to once per day, you’re never obligated to use any of the funding Kabbage approves for your business. If you have no outstanding balance, no monthly payment is required. Kabbage provides an extensive section of educational articles, guides, infographics, blog posts, videos, and webinars covering the most important aspects of running a business. Visit the resource section and choose from categories such as growth, funding, management, and innovation to access relevant resources. You can also contact Kabbage via phone or email with additional questions and concerns. Email may be sent through the website or directly to support, and messages are typically answered within 24 hours. This fast response time prevents delays from interrupting important business operations. FAQs provide answers to common questions about the loan process and service features. If you have any questions about how funding works, what the payment and fee schedules are like, or how the application process works, you’ll find the answers here. A loan calculator is available under the “Business Loans” drop-down menu to help you figure out the total cost of different loan amounts. 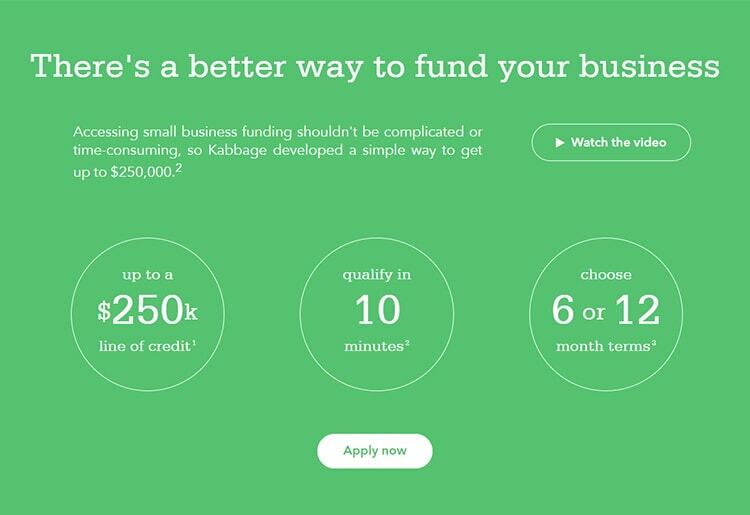 Kabbage is a useful lending option for the modern small business. The automated review and approval process takes the confusion out of applying for a loan and gives you more time to focus on running your company. Requirements are straightforward, and Kabbage looks at more than just a credit score when determining whether or not your business qualifies. By offering multiple loan amounts, Kabbage is able to service a variety of businesses nationwide. The terms and fee structure are easy to understand, and no hidden fees are charged. All loans are structured in the form of credit lines so that you can withdraw money on an as-needed basis and don’t have to worry about making payments unless you have an outstanding balance. Multiple withdrawal methods and an automatic payment system make Kabbage preferable for on-the-go business owners. You get access to cash wherever and whenever you need it, meaning your business can keep going even if you’re not there to immediately solve a cash flow problem. 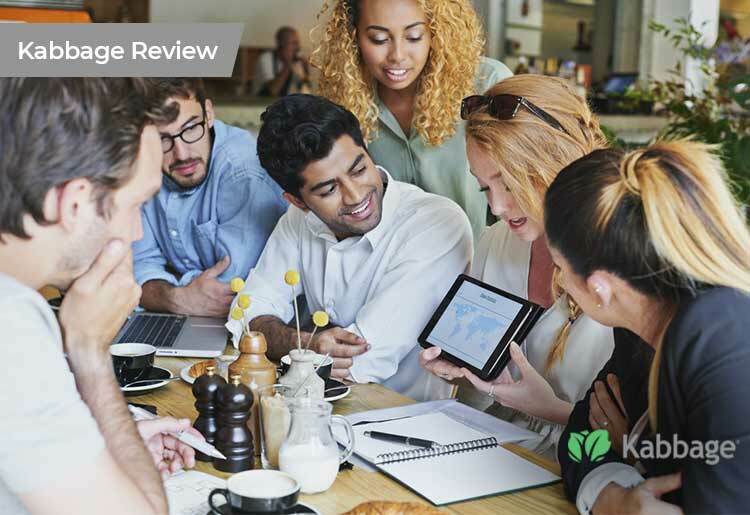 With an A+ Better Business Bureau rating and detailed security policy, Kabbage has earned the reputation as a reliable small business lender.